Hormones act at the cell surface and/or within the cell. Many hormones bind to specific cell-surface receptors where they trigger internal messengers. Cell surface receptors are a family of ‘G proteins’ which bind the hormone on the cell surface and then activate socalled ‘second messengers’ via GTP. The second messengers include cyclic AMP for adrenocorticotrophic hormone (ACTH), luteinizing hormone (LH), follicle stimulating hormone (FSH) and parathyroid hormone (PTH), a calcium-phospholipid system for thyrotrophin releasing hormone (TRH), vasopressin and angiotensin II, and tyrosine kinase for insulin and insulin-like growth factor- 1 (IGF-l). These then cause rapid alterations in cellmembrane ion transport or slower responses such as DNA, RNA and protein synthesis. 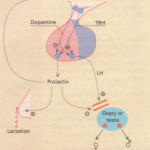 Some hormones act by activation of the membrane-bound phosphoinositide pathways. 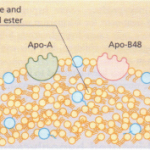 Others, especially steroids, enter most cells of the body where they act on intracellular protein receptors, often altering the activity of intracellular enzymes by phosphorylation or dephosphorylation. Steroid hormone-receptor complexes are usually transported into the nucleus, where they interact with D A to regulate gene transcription, and thus protein synthesis. The characteristics of different hormone systems. 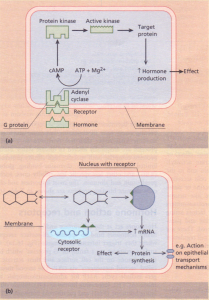 The sensitivity and/or number of receptors for a hormone is often decreased after prolonged exposure to a high hormone concentration, the receptors thus becoming less sensitive (‘down-regulation’) e.g. angiotensin II receptor, f3-adrenoceptor. The reverse is true when stimulation is absent or minimal, the receptors showing increased numbers or sensitivity (‘up-regulation’). Abnormal receptors are an occasional, though very rare, cause of endocrine. Most hormone systems are controlled by some form of feedback; an example is the hypothalamic-pituitarythyroid axis. 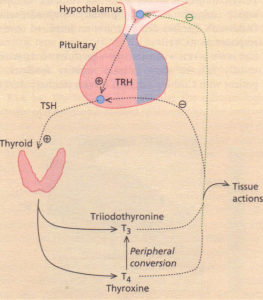 I TRH is secreted in the hypothalamus and travels via the portal system to the pituitary where it stimulates the thyrotrophs to produce thyroid-stimulating hormone (TSH). 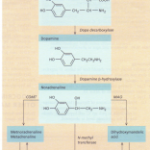 2 TSH is secreted into the systemic circulation where it stimulates increased thyroidal iodine uptake and thyroxine (T.) and tri-iodothyronine (T,) synthesis and release. 3 Serum levels of T, and T, are thus increased by TSH; in addition, the conversion of T, to T, (the more active hormone) in peripheral tissues is stimulated by TSH. 4 T. and T3 then enter cells where they bind to nuclear receptors and promote increased metabolic and cellular activity. 5 Blood levels of T3 and T. are sensed by receptors in the pituitary and possibly the hypothalamus. If they rise above the normal range, TRH and TSH production is suppressed, leading to less T. and T3 secretion. 6 Peripheral T3/T. levels thus fall to normal. 7 If, however, T3 and T. levels are low (e.g. post thyroidectomy), increased amounts of TRH and thus TSH are secreted, stimulating the remaining thyroid to produce more T3 and T.; blood levels of T./T3 may be restored to normal, although at the expense of increased TSH drive, reflected by a high TSH level (‘compensated euthyroidism’). 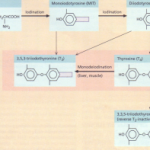 This is known as a ‘negative feedback’ system, referring to the effect of T. and T3 on the pituitary and hypothalamus. There are also positive feedback systems, classically seen in the regulation of the normal menstrual cycle. 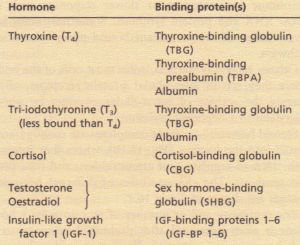 Characteristics of different hormone systems. Hormone secretion may be continuous or intermittent. The former is shown by the thyroid hormones, where T. has a half-life of 7-10 days and T3 of about 6-10 hours. Levels over the day, month and year show very little variation. In contrast, secretion of the gonadotrophins, LH and FSH, is normally pulsatile, with major pulses released every 2 hours or so. Continuous infusion of LH to produce a steady equivalent level does not produce the same result (e.g. ovulation in the female) as the intermittent pulsatility, and may indeed produce down-regulation and amenorrhoea. Thus the long-acting superactive gonadotrophin releasing hormone (GnRH) analogue buserelin produces down-regulation of the GnRH receptors and subsequent very low androgen or oestrogen levels, which are clinically valuable both in carcinoma of the prostate in men and in infertility in women. Pulsatile GnRH administration on the other hand can produce normal menstrual cyclicity, ovulation and fertility in women with hypothalamic amenorrhoea but intact pituit ary LH and FSH stores.